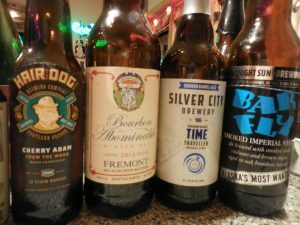 With all the holiday and birthday celebrations, a veritable cascade of craft beers flowed into my glass: Some aged, some hopped, many rich, many malty and all made by craft brewers. Craft brewers are small, innovative brewers. Small is defined as an annual production of 6 million barrels or less. Craft beer is usually made with the traditional ingredients of malted barley, yeast and hops for a variety of different styles, but employing interesting techniques and innovative ingredients creates even more styles to choose from. Think bourbon barrel aging or adding maple syrup or raisins. In 2017, there were a record number of craft breweries in the United States – over 6,000. As of July of this year, there were 6,655 United States breweries, the most in history. This surpasses 1873 — yes, 1873 — when there were 4,176 breweries in the 37 United States. European craft breweries are still ahead with over 8,500. Statistics show 6,071 craft breweries in seven leading countries in Europe in 2017. The United Kingdom has the largest number with over 2,000, followed by Germany with 1,295. As a result, most of us live within 10 miles of a craft brewer or two or six. And if each craft brewer made six beers, well, you get the picture. There are many beers in this world. Each made with a different combination of malted grains, hops and yeast. There are hundreds of yeast varieties. In 1841, yeast was identified as the prime engineer of fermentation. Since then, yeast strains have been cultivated and redesigned for their unique aromas and flavors. In the beginning, styles of beer were driven by climate. For instance, colder regions used yeast that could ferment at colder temperatures. Today, craft breweries use clean cultures of yeast for better control of fermentation. Wild yeast is everywhere and can cause off-aromas and flavors. However, there are some breweries that use wild yeasts with great success, predominantly in the Lambic beers of Belgium. In the beginning, there were the noble hop varieties of East Kent Goldings, Fuggle, Hallertauer, Saaz and Tettnang. Now, some of the trendiest hop varieties are, like cultured yeasts, cultivated for unique aromas and flavors. Hops are used in four ways: bittering, aroma, fresh and dual. 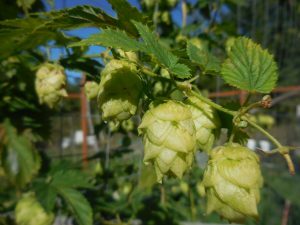 Bittering hops, most likely in IPAs, tend to have a high amount of acid and the accompanying bitter flavor. Aroma hops have less acid and more complex aromas. Most brewers use both at different stages of the fermentation process. Fresh hop means the beer was made from hops that were harvested less than 24 hours before the beer was brewed. Naturally, these beers are brewed during harvest season. Dual hops have high levels of alpha acids (bitterness) and ample aromas. Hops are the spice of craft beers. Some are tropical, others piney, some earthy, some floral and some hops have more alpha acids, which contributes to bitterness. Traditional hops originated in Germany and England. Others were bred in the last century, such as Centennial bred for its aroma, Nugget, a resiny bittering hop, and the popular American-bred Willamette. These days, designer hops have become fashionable — like Mosaic, Citra and Simcoe. And new hop varieties are continuing to be bred resulting in brews that may taste and smell of tropical, lemon, blueberry, tangerine and grapefruit. Others have pronounced piney, spicy, rosy, herbal or even a bubble gum character. 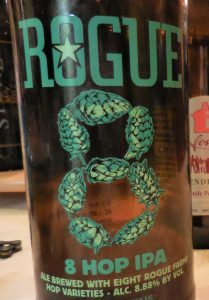 Although not aged in a cellar, Rogue’s 8 hop (8.88%) and 10 hop (10.10%) IPAs are richly brewed from hops grown on Rogue Farm. In the 10 Hop, Liberty, Independence, Revolution, Keven, Adair, Rebel, Newport, Yaquina, Freedom and Alluvial hops were used. Belgian beers are favored by this group of craft beer fans. Sound Brewery Tripel Entendre (9.9%) and Entendez Noel, a Belgian Style Pale Quadrupel (11.8%), were pulled from the cellar. 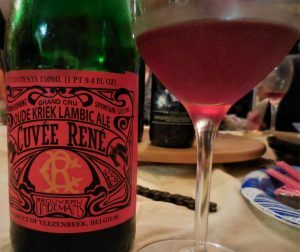 Brouwerij Lindemans Cuvee Renee was a beautiful Oude Kriek Lambic ale made with cherries and wild yeast that was lost in someone’s cellar for a few years. Another masterpiece was Liefmans Cuvee Brut, an aged ale made with cherries and cherry juice, barley malt, sugar and wild yeast. 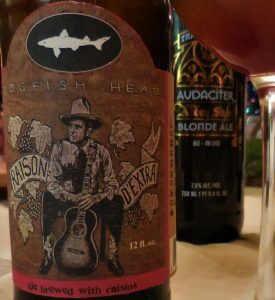 Dogfish Head Raison D’Extra, pushing the Belgian yeast to 15%, is brewed with “an obscene” amount of malt and raisins. 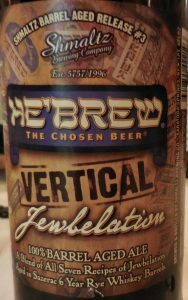 And the hilariously-labeled-but-totally-delicious He’Brew the Chosen Beer Jewbelation, a Sazerac Rye Whiskey barrel-aged ale, is a Hanukah brew similar to a Christmas or Winter beer style. Another wonderful winter beer was a 2015 Silver City Bourbon Barrel Old Scrooge (9.6%), and the Austrian Samichlaus Helles, a malt liquor of 14%. 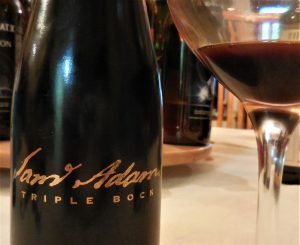 Sam Adams 1995 Triple Bock — brewed with malted barley, noble hops and maple syrup — was aged in whiskey barrels. A first, back in 1995. The Orkney Brewery’s Skull Splitter, named after Thorfinn Einarsson the 7th Viking Earl of Orkney, comes in a 330 ml bottle, which is a good thing for this rich, sweet dessert beer with an ABV 8.5%. Not only was this a wonderful celebration of a couple of holiday birthdays, but watching the Seahawks clinch a berth in the playoffs made for hearty cheers!